Would you walk 1000km to bring good news? When I led The Light Project in Chester I received a strange request. Could a French couple come and work with me for 6 months… They wanted to learn English and new ways of sharing faith. Philippe and Veronique Gatti joined my ragamuffin group of trainees and evangelists in Chester for 6 months and worked alongside us. My life hasn’t quite been the same since. They are inspirational, and I don’t mean that as a nice thing to say. They truly inspire me in my faith and make me long for more of God. Despite not being able to speak much English at all they also got a job in the local Burger King! They got to know the staff and when they left the presented each one with a bible. The staff team gladly accepted as they had seen the bible written out on their lives so beautifully. Since then, nearly 10 years, we have kept in touch, prayed for each other and I get to visit them in France now and again as well as they visit us in Cambridgeshire. As well as serving locally as missionary’s they embark on walks. And I mean long walks! Sometimes in the Himalayas, sometimes the Alps. They walk to share good news with people. 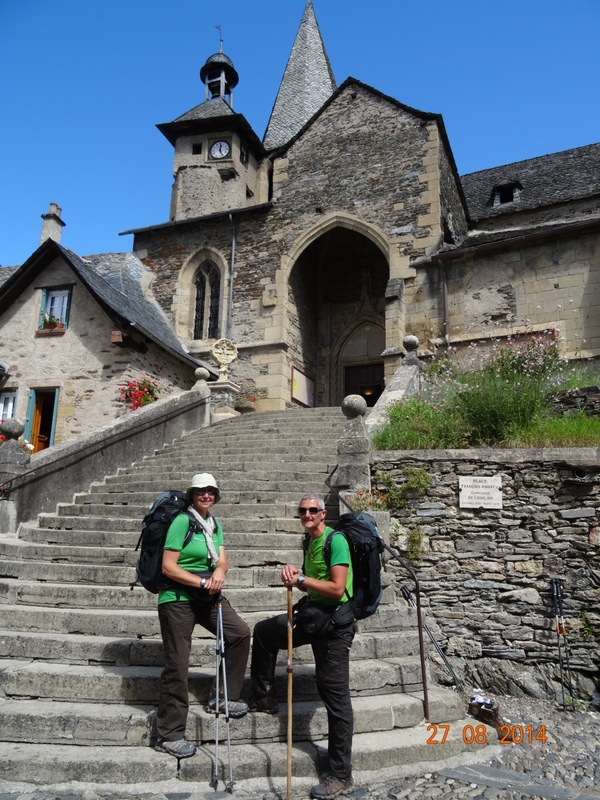 They’ve just reached the 1000km Mark of the the walk of ‘The Way’- St James in Spain and France, ‘Compostelle’ the famous walk for pilgrims and they are meeting many spiritual seekers as they walk and they share the good news of Jesus. They offer each person they meet a gospel of John in whatever language they speak and also offer prayer and a listening ear. This couple are extraordinary! Here is their latest report from their walk. If you would like to receive their reports please do leave a comment below and I would be delighted to forward you their progress reports and prayer letters too. Below they detail some of the people they have met over the past week. Thursday 2 October, Viloria de Rioja 1000km! After passing beautiful Navarre, we journeyed through Rioja between the vines and the fields of harvested wheat… We met up with Nancy again, the young Israeli with whom whom we’d had a very powerful time as a result of her deep questions.Please continue to remember her in your prayers. We had a wonderful welcome in Villamayor de Monjardin where there are a group of Christian volunteers from different countries who serve the arrivals. Each pilgrim receives a Gospel of John at the end of a shared dinner. Of course we have made sure that we’ve kept ours! At Logroño there was also a warm parish welcome organised by a French couple ! We have made contact with several pilgrims we’ve met along before, such as James from Hungary and Paul from Denmark with whom we were able to share more deeply. Please pray for their faith walk. After several foggy days the sun has returned. Today we entered the region of Castille and Leon. We were encouraged by our meeting with Barry from England, a Christian who came to faith after reading the Gospel ! A newly retired doctor, he’s seeking the best way to direct the rest of his life … May the Lord lead him perfectly. We are approaching Burgos where we must be on Sunday, after passing through Belorado and San Juan de Ortega. 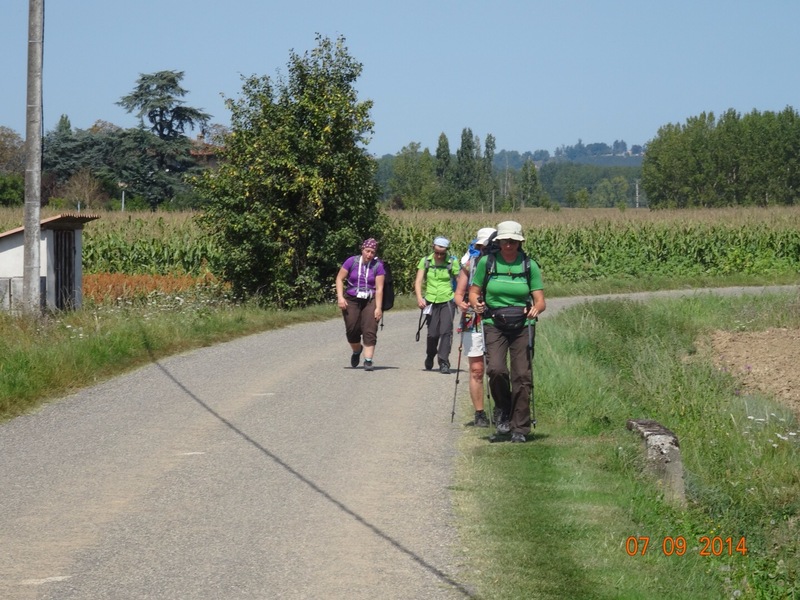 Our feet are much calmer and the routes are pleasant; We are crossing Spain in the right season! We think of you with love and thank you so much for all your messages of encouragement! If you pray, please do so for my lovely friends who combine their passion for walking and their passion for Jesus most powerfully. Names have been changed in this report to protect the identity of those they have met. Hello! My name is Rowdy Van Horn, and I am a pastor in Phoenix, AZ, USA. My wife, Ashli, and I met Philippe & Veronique in The Hague about 14 years ago! We were ministering with the Maasbach family there in the Netherlands. Just the other day I opened an old file in my office, and there was a card with their names on it. I decided to try looking them up, and here is your post!! And it looks like you JUST posted it!! Wow! Would you have time to forward my information to them? We had a very beautiful time with them. At the time, Philippe could speak NO English, and Veronique tried to translate a bit. And of course, we spoke no French 🙂 We mostly just had a nice time being with them. A great couple for the Lord. Please let me know if you received this, and if you could give them our info. Thank you so much! Got it- I love the timing of The Lord! I shall forward your details to them. They would be delighted to hear from you I am sure, what an encouragement. God bless you Rowdy.